Roger Morris, in a sequel to A GENTLE AXE, takes us back to 1868 St Petersburg and embroils master detective Porfiry Petrovich, the character created by Fyodor Dostoevsky in CRIME AND PUNISHMENT, in a complex multiple murder mystery. Raisa Ivanova Meyer, and her disabled son Grisha, are poisoned by chocolates bought from Ballet the confectioners, by her husband Dr Martin Meyer, a public health inspector. The obvious solution is that the doctor wanted to dispose of his wife, who has a tawdry past history, and continue his supposed affair with the pretty young family maid. But Lieutenant Salytov believes the whole matter is connected with dissident groups when he finds incriminating leaflets in the apartment of Tolya, a young man who works at the confectioners. The hot stifling summer and the city's putrid atmosphere caused by the lack of an effective drainage system tempt Porfiry Petrovich to accept the easy solution. He has his own problems with a new assistant to train, the stink from the drains permeating into his office, and an awkward health problem, his haemorrhoids! But when Colonel Setochkin is apparently shot with his own duelling pistol by Vakhramev for seducing Tatyana, his daughter, Porfiry Petrovich notices a connection. Both Meyer and Vakhramev had received letters from a mysterious anonymous source. Porfiry, and his assistant Virginsky, systematically investigate the secrets and past history of the victims, and when there is another murder it leads their investigations into the squalid heart of the city, where the poor live amid filth and degradation. This is an excellent, very enjoyable, historical crime mystery which captures both the feel and atmosphere of 19th century Russia as a decaying Kafka-esque empire waiting for a revolution. The book's cover with an evocative picture of a man hustling over a canal bridge seems to draw you into the mystery. You really feel you are in the dachas, imperial offices and squalid tenements, or riding in the drozhki through the streets of St Petersburg. In one memorable passage from the book Roger Morris' descriptive powers are too good and I felt distinctly queasy. "Pavel Pavlovich, is there something else you wish to say to me?" Virginsky turned quickly in his seat. "I had thought that your methods were more subtle than this. I had believed that you used psychology and exercise of the intellect to solve your cases..."
The whole story has an aura of authenticity with the stark Victorian age contrast between great wealth and apparent propriety, as opposed to disgustingly squalid living conditions and immorality. The plot throws up intriguing red herrings, such as the difficult relationship between Virginsky, his father, and his young pretty stepmother. It all adds to the increasing tension and sense of foreboding as the plot progresses to its climax. The limitations of mid Victorian science to solve crimes, means the painstaking investigation and elimination of suspects must be done by detectives who try to understand the psychology of criminals. I, like probably many readers of modern crime fiction, have never read Dostoevsky, but I am sure the Roger Morris series will encourage many to try the Russian classic CRIME AND PUNISHMENT as a result of enjoying these reincarnations of Porfiry Petrovich. 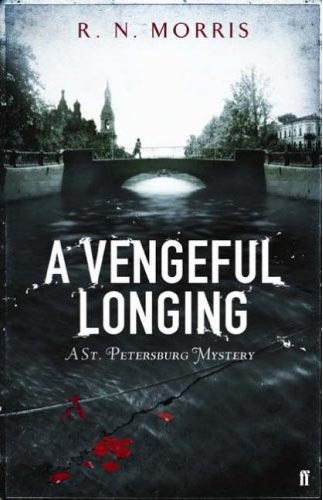 Read more reviews of A VENGEFUL LONGING here and here.